Photo courtesy of LSC Ranch, home of "LSC's Miniature Boxers"
There are a lot of breeders breeding what they call the Miniature Boxer. 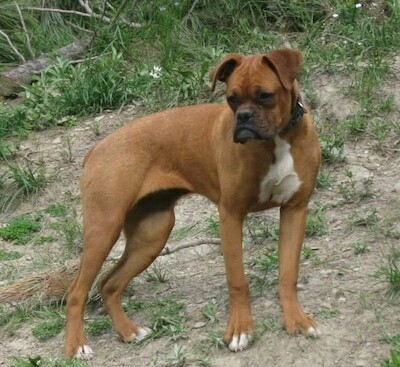 While many breeders have their own version of what goes into the genes of the dog, they all seem to have one goal in mind and that is for the dog to look like a smaller version of the purebred Boxer. Some have been more successful than others in their attempts. Some breeders are simply breeding the Boston Terrier mixed with the Boxer. The best way to determine the temperament of a mixed breed is to look up all breeds in the cross and know you can get any combination of any of the characteristics found in any breed. Not all of these designer hybrid dogs being bred are 50% purebred to 50% purebred. It is very common for breeders to breed multi-generation crosses. There are even cases where the dog does not even have Boxer in it at all, for example some are crossing the Rat Terrier with a Pug and calling it a Mini Boxer. Others call this mix a Puggat. Another example is a cross of the Pug with a Toy Fox Terrier. Others call this mix a Toy Poxer. Still others are more seriously working on creating a new purebred, writing a breed standard and registering it. These particular dogs are stated to have at least 50% Boxer. 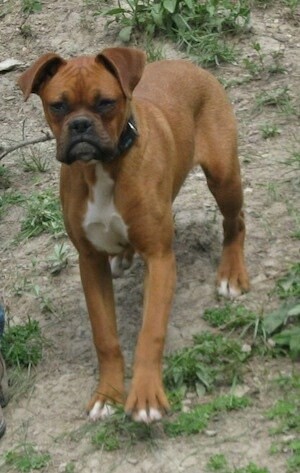 25% Boxers can be considered as breeding stock as well, as long as they are being used to breed for higher percentages. They can have up to 25% Pug, 25% Beagle, and up to 50% Boston Terrier, not to exceed 50% total Pug, Beagle and Boston combined. Other breeds may also be included in the future to broaden the gene pool. Photo courtesy of LSC Ranch, home of "LSC's Miniature Boxers"—"I am currently working on taking the Miniature Boxer all the way and trying to make it an actual breed and not a hybrid."